The average age of an attention deficit disorder diagnosis is age 7: this is a time when pressure at school mounts and children need to begin to focus and sit still for long periods of time. Parents of children with ADHD usually start to notice symptoms around age 3, but grade school is when the pressure begins to find a ‘solution’ so that the child can pay attention in class and not get left behind. Parents, rightly concerned, are seeking natural solutions for their children facing an ADHD diagnosis that do not involve pharmaceutical interventions like Adderall, and other amphetamines. 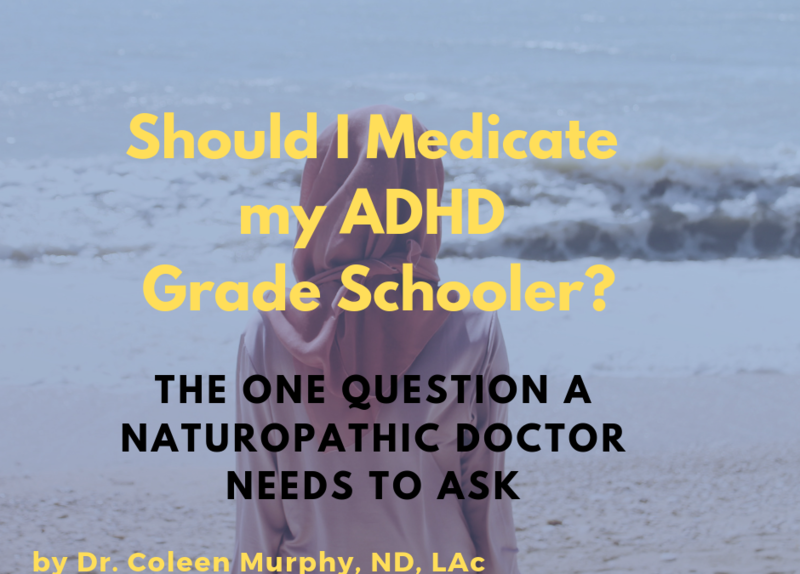 I often get involved in this stage as parents seek a second opinion or alternate path to get to the root cause of the problem and treat it with natural therapies. Pharmaceutical approaches are valid and have their time and place, but MD’s are often quick to offer the simple fix and parents bend under the will of the teachers and schools whose interests are toward the collective learning environment. The middle path for many parents is one that involves every attempt to fix the problem without resorting to amphetamines. Tell me about your morning routine on school days? Everything I need to know is often buried in this answer and why it is so important…. Sleep: Did child wake up on their own or did they need to be woken up from a deep sleep? Sleep is everything and ADHD kids are notoriously difficult to get down, they may have a hormone imbalance impacting melatonin production that only a blood test can tell. Or maybe your child just does not get enough physical activity every day. In short: Sleep is everything. Until your child is consistently waking up on their own or with mild stirring on school days, you should not even be considering pharma interventions. Fix the sleep is the first and sometimes only step needed for the ADHD child. Food: No, it’s not as simple as ‘eliminate wheat and dairy and/or carbs’. In fact, a breakfast of complex carbohydrates can offer sustained energy throughout the day which helps with focus. Everyone is different so there is no one diet that is right for all children; but as a parent if you have not given this any thought or have not experimented with food journaling for your ADHD grade schooler, then you have not done your homework prior to medicating. Also, ADHD parents should send lunch with their children and not rely on cafeteria food to nourish and power your little dynamo throughout the day. Environment and Routine: Taking the non-pharma approach takes time and effort, it is not the proverbial ‘quick fix’. The parent/guardian needs to be high contact with the child throughout the morning. A solid routine needs to be established that allows the child and caregiver to prepare for success throughout the day. I recommend this process to be at least 50 minutes: After waking on their own, the child is directed to a quick shower (not hot bath) with vigorous towel dry. Clothes have been laid out the night before, they know where to find their clothes, get dressed and then head to breakfast. During breakfast the child will take a variety of nutraceuticals, vitamins, herbs, supplements etc. that are right for them and their condition. I may prescribe CBD (cannabidiol), caffeine and/or adaptogenic herbs to be taken in the morning. The morning is relaxed, calm and no homework is left over from last night. A music mix plays building up from soothing gentle songs to high-energy beats as they head out the door. The child has a ‘send off’ song that they choose themselves. Affirmations: ADHD is a behavioral disorder with biochemical roots. A naturopathic doctor treats the whole person, so I recommend that each family develop 4-6 affirmations that the child repeats each morning to the mirror: “I listen attentively in class”, “I am in control of my body and keep my hands to myself at all times”, “I respect the teachers and follow their instructions”, “I do my work in class” etc. Send Off and Goodbye: The morning was predictable, unhurried with positive discussion that makes clear the expectations for participation and good behavior all day long. Music, lighting and mood were not overlooked. The child has a nutritious lunch, neat and orderly class binder and necessary materials. They may have supplements that they take at lunch time to help with afternoon focus. They may have a special toy or distraction gadget that the teacher has allowed. So should you medicate your ADHD grade schooler?–Tell me about a typical school morning in your home? If you have a child diagnosed with ADHD and are being pressured to consider medications, you can call me to discuss. I offer treatments from my office in Lake Forest, CA or virtually world-wide. I also provide expert guidance on the use of CBD for pediatric disorders and integrating CBD in a 360-degree treatment program for pediatric ADHD. Let’s talk!